Over the years as professional turf growers, we have regularly been asked to undertake regular lawn care work for some of our customers. In response to these requests we have developed the following basic lawn care program which we modify to suit the individual requirements of each garden. 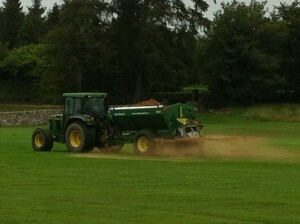 A Spring Feed to restore the fresh green colour and get the grass growing. A Summer Feed will keep the grass growing and competing with the weeds. We can apply a specialist lawn weed killer to eliminate the difficult problem weeds. An Autumn Feed will keep the grass lush and green and growing for as long as possible into the late autumn. A Winter Feed sets up your lawn to survive the Winter in the best possible condition and sets it up for next seasons growth. As optional treatments – as the need arises, we can aerate and scarify the lawn, this is usually done in conjunction with a moss control treatment. This removes the build up of moss and allows the surface water escape and lets air into the soil. Following on from this and to maintain the benefits of the work gone before, we can apply a high quality sand top-dressing, this will improve drainage, level the lawn and helps to delay the build up of thatch and moss in the lawn. The cost of this work is based on the size of the lawn and the type and number of treatments required. We will do as little or as much as you require, in order to bring your lawn to your desired standard. With branches in the UK and Ireland we can get you what you need, where you need it.